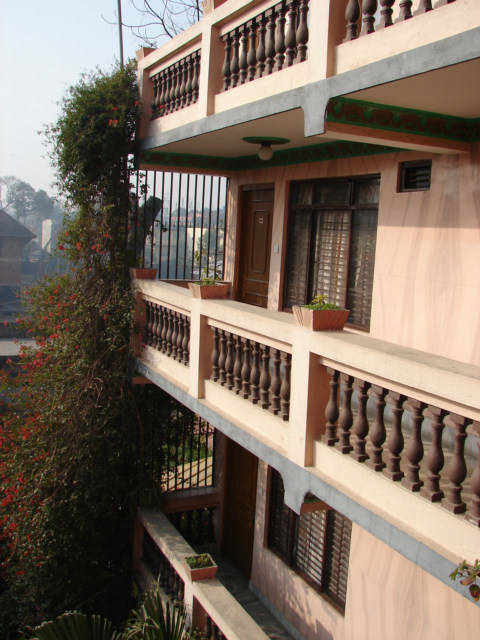 The cost of the room is 500 Nepal Rupees or 8 US Dollars. I think it is relatively safe to say as a guide to choosing a hotel. When it is hot, choose the ground floor rooms in the shade. When it is cold, choose the higher room in the sun. This is my room in the sun, in the morning and during the day, the sun shines into my room creating a greenhouse affect that continually keeps my room above the cave temperature. The world has a prevalence of concrete or brick rooms, this brink or concrete retains heat or cold, and can be either a benefit or hindrance. It is cold presently here in Kathmandu, Nepal, during the day, it gets quite warm, however, the concrete almost never warms. I have this room on the third floor and keeps me warmer. The room is large, had a TV with HBO, Star Movies and CNN, and many India type stations. Includes private bath, hot water and a great view from the top of the world.